I'm sure it hasn't been lost upon most people that the price of eating out has gotten pretty expensive in the past decade. Yes, inflation is a real thing and the operational costs of restaurants are only getting higher (wait til the minimum wage gets up to $15.00...). However, that isn't the only reason for the higher prices either. 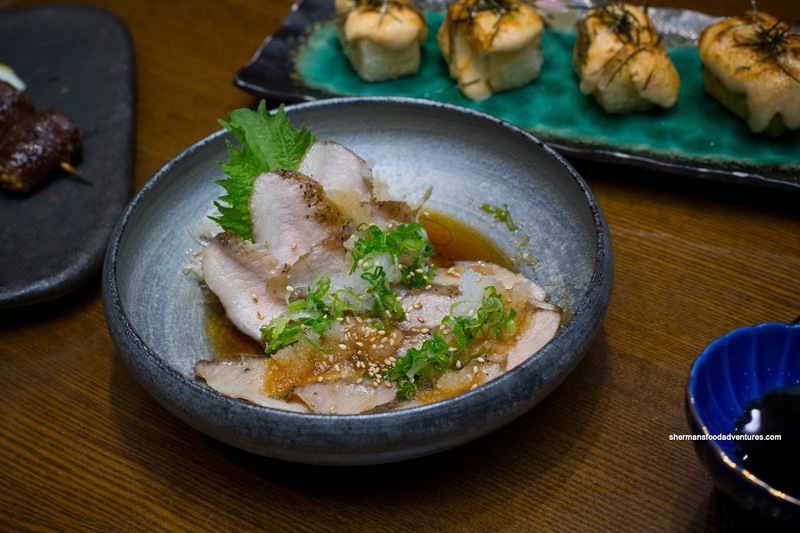 There has been an increased appetite for higher-end pricing for all types of food including the traditionally more moderately-priced Asian cuisine. Sure, you can attribute it due to influx of wealthier immigrants, but there has also been a shift towards more refined experiences for all types of food. This is most apparent in Richmond where we find expensive everything including my most recent visit to Com Vietnamese and Haidilao. 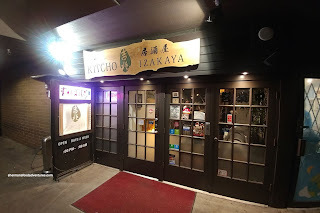 Now we can also add Kitcho Izakaya to the list. I recently visited the place prior to my visit to Bobii with Emily, Nora and Joyce. We each started off with probably the best dish of the night being the Uni Chawanmushi. 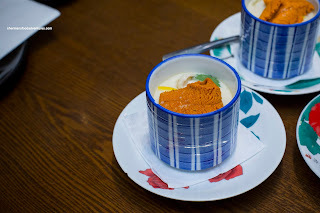 Although the chawanmushi was small in size, that didn't stop them from topping it with a large piece of fresh uni. I found the egg to be fluffy and mildly-seasoned with minimal excess moisture. Hidden within, there was a tender piece of chicken, mushroom and a large meaty shrimp (oxymoron I know...). After this, we ordered a bunch of items, but the server seemed more interested in helping another table and actually left halfway into our ordering. That probably explains why some of our Nigiri was messed up where they left a few items out. 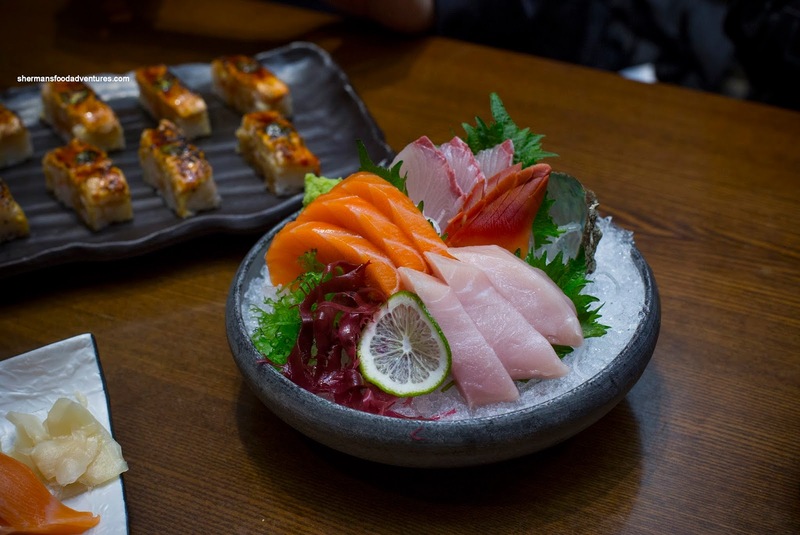 The stuff that actually showed up was Salmon, Bluefin Tuna, Amaebi, Hamachi and Foie Gras. Can't say anything bad about the fish quality because it was excellent. The knife skills for some of them could've been better though. 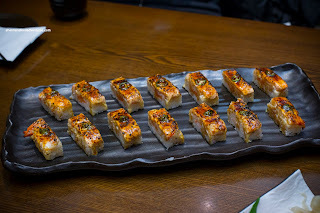 We took our chances on the aburi sushi where we got both the Salmon and Ebi Oshi. 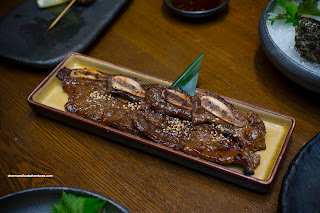 Sporting 7 pieces each, these definitely looked the part with an attractive char and generally appetizing appearance. One bite and yes, these were pretty legit with chewy sushi rice topped with buttery shrimp and equally buttery salmon. On top of that, we found a creamy mayo that was nicely caramelized. The salmon featured the classic thinly sliced jalapeno while the ebi had a dollop of impactful pesto. Just to sample a bit of everything, we got the Assorted Sashimi featuring hokkigai, hamachi, salmon and tuna. 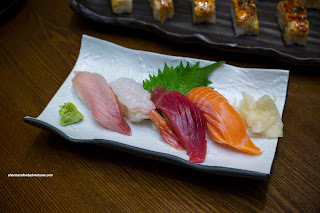 This was fairly straightforward with the same fresh and texturally on point fish as the nigiri. Although the buttery hamachi was good, I felt they sliced it far too thin. This wasn't merely about value, but the thin slice didn't eat particularly well as a result. One of the more surprising dishes was the Mentaiko Tofu. That wasn't something I would've ordered, but thanks to Joyce, we each got a really tasty bite. It featured a fried tofu square topped with a mentaiko that was creamy and rich. It was briny and sweet which went well with the crispy tofu. In my opinion, the key to this dish was the amount of mentaiko on top as it was enough to completely flavour the blank canvas. Off to some robata, we had the Ton Toro that was sliced thin and dressed with grated daikon, green onions and yuzu ponzu. The tender slices featured the usual buttery bouncy texture that was slightly smoky. Tangy, sweet and salty, the dressing was enough to ensure this was a tasty dish. 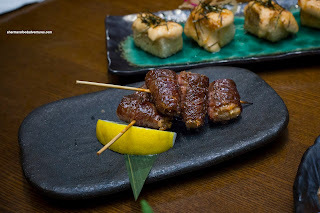 Staying with robata, we also got the Beef Mushroom featuring a thin layer of beef wrapped around enoki. Again, there was more than enough charring to create a caramelized smoky flavour. As much as the thin slice of beef was cooked thoroughly, it was still tender with crispy bits. 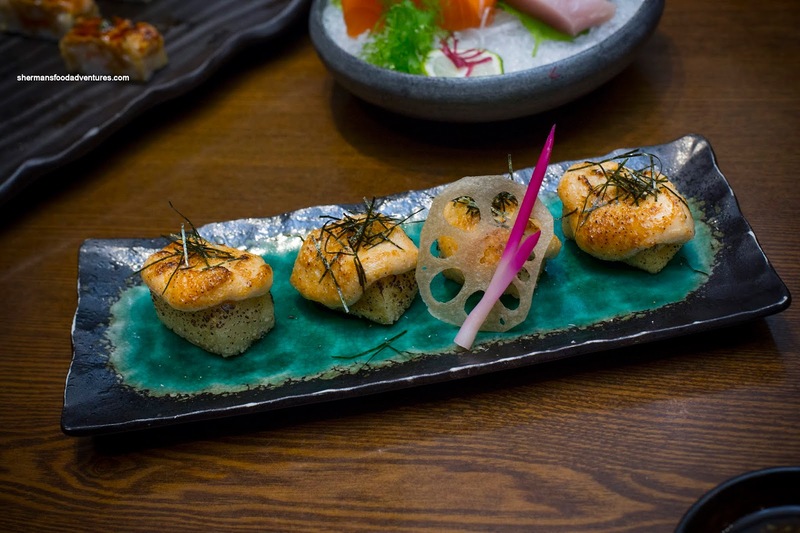 Inside, the enoki was cooked just enough where it retained a bite and exhibited its classic earthy notes. 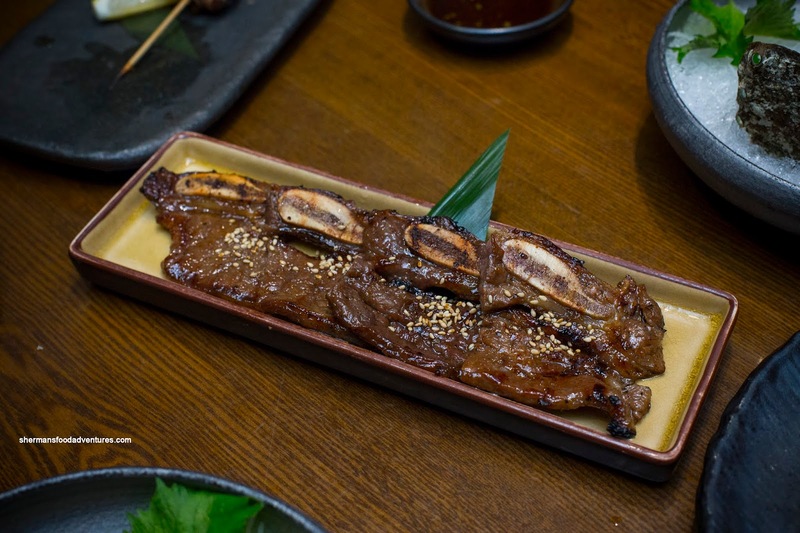 As much as Beef Short Ribs can be a standard on many grill menus, the one here was a highlight. Sure, it could've used a bit more char, but the flavours were still caramelized. Best thing about the ribs was that they weren't overmarinated so there was still a fatty beef taste. Maintaining a meaty texture, these were buttery tender. 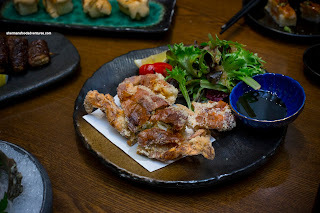 The Soft Shelled Crab was not our last dish, but I decided to put it at the end (wanted to keep the robata stuff together). Not trying to repeat myself, but this was also executed properly. Beyond the light crispy batter, the crab was moist, briny and sweet. It was served with a ponzu dipping sauce. So in the end, we all agreed the food at Kitcho was pretty darn solid with little to complain about. However, there are a couple of serious caveats to this. First, the pricing is far too high in our opinion, especially given its location (not in Downtown). Second, the service was not up to the level of their pricing either. We were rather confused and appalled that our server left halfway through our ordering to attend to a more "affluent" table (they ordered more expensive stuff). Hence, our order was messed up as a result. Not acceptable at any level of restaurant.